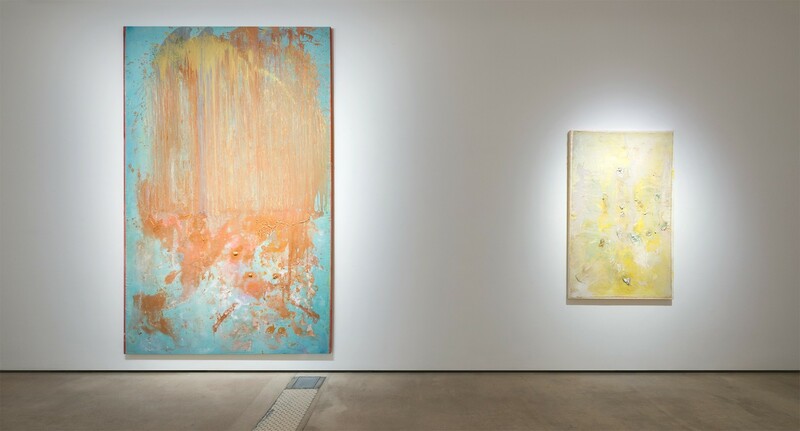 Hales Gallery is delighted to announce Frank Bowling: Fishes, Wishes in Summertime Blue, a solo exhibition of Bowling’s very recent works. The exhibition coincides with Frank Bowling: Metropolitanblooms, the inaugural project at the Hales Project Room in New York. 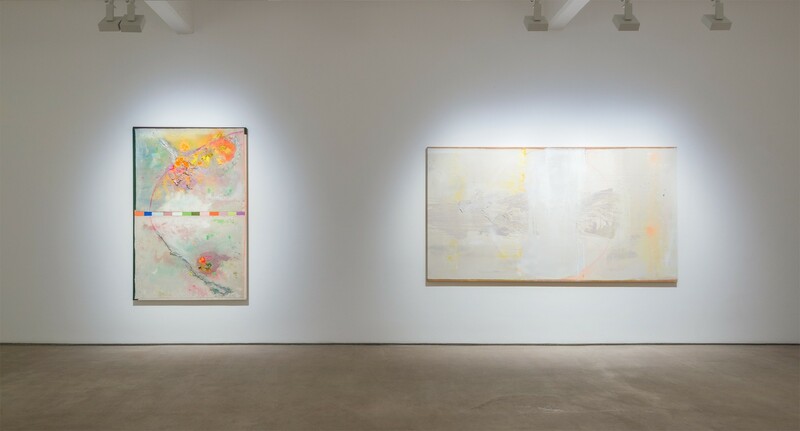 Now widely recognised as ‘first among equals’1 in the field of post-1960 abstraction, Bowling has for the past half century devoted himself to a tireless investigation into the nature and possibilities of painting, constantly exploring new principles and processes. It is this dynamic spirit which this exhibition celebrates, providing audiences an opportunity to explore the rich vocabulary of techniques and ideas which Bowling has developed over the years and which is so fluently expressed in his contemporary practice. 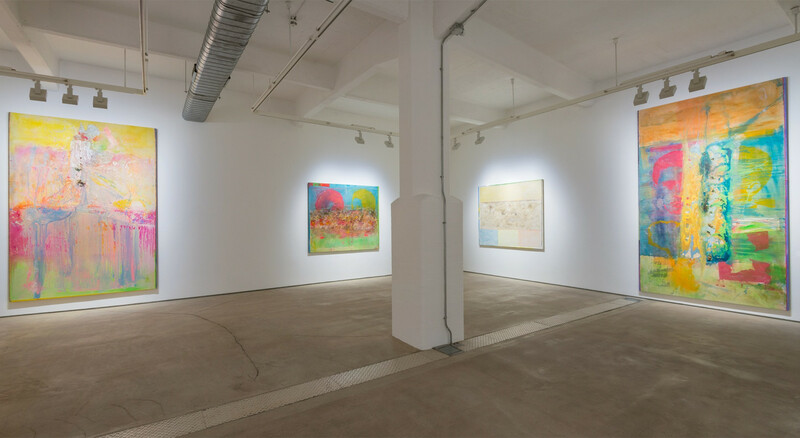 The exhibition at Hales London takes its title from a 2016 painting which itself alludes to a series of canvases stretching back to the 1980s whose textured, animated surfaces have invoked for Bowling the creatures and colours of rivers and seas. It is just one example of the way in which the works in this exhibition delve both inwards and outwards, excavating the past while absorbing Bowling’s new experiences and memories of the world around. In the monumental Pouring Over 2 Morrison Boys & 2 Maps II, for example, references to key moments from the history of Bowling’s painting career – his early Pop-inspired screen-printed portraits and stencilled maps, and the New York ‘poured paintings’ from the 1970s, celebrated by Clement Greenberg – are fused together in exciting new configurations. The idea of a fusion, or convergence, of multiple perspectives has become increasingly central to Bowling’s approach over the years. This is expressed not just in amalgamation of motifs or the more literal stitching together of canvases, which has become a recurrent technique in his paintings, but in the whole-hearted embrace of dialogue and collaboration, which has come to characterise Bowling’s approach to artistic creation. The interpersonal world mapped out in his paintings’ titles – Iona Miriam’s Christmas Visit To & From Brighton; Collaboration with MS & Damidge – accurately conveys the generosity and sociability of Bowling’s painting process: inviting friends and family to mix and pour paint; cutting up and painting over donated canvases; incorporating presents and souvenirs into the surface of his paintings. Cutting, stitching, pouring, staining, sticking, stencilling, screen-printing: for Bowling, painting has always been an intensely physical as well as aesthetic process. 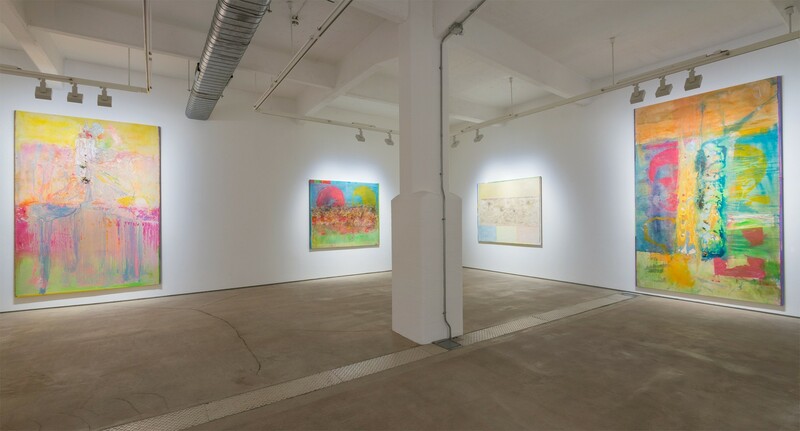 A rigorous understanding of and careful attention to colour and geometry is combined with the spontaneity of the painter in his studio, which actively informs the shape and composition of his canvases: see, for example, the rectangular shape of Bowling’s working table or the circles of his paint buckets - all recurring on the surfaces of the works in the gallery. 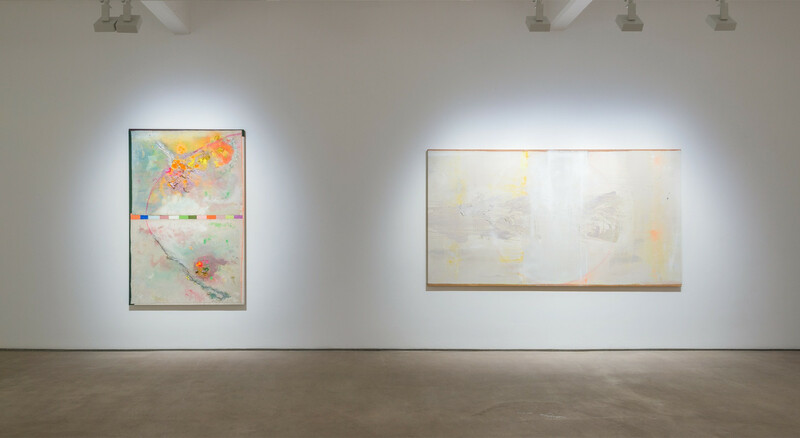 1 Okwui Enwezor, Frank Bowling: Mappa Mundi (exh. cat. ), 2017, p. 24.